Yesterday I posted something about my early days of learning Mandarin. I often think back to those days. 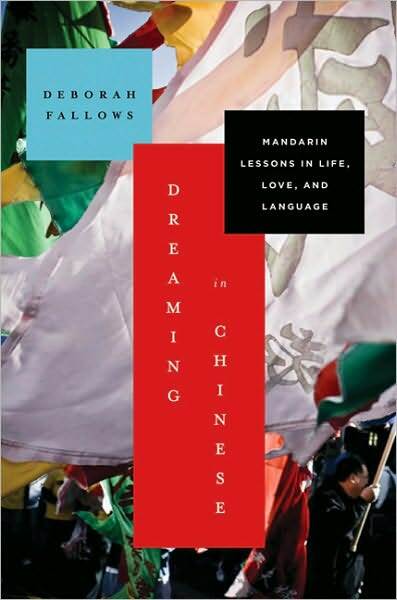 And that was certainly the case when I read Deborah Fallows’ new narrative, Dreaming in Chinese: Mandarin Lessons in Life, Love, and Language (Walker & Company, 2010) this week. I’d read mixed reviews of her book in several newspapers, but thought I’d judge it for myself. The good news is that I didn’t find the book boring or that I couldn’t read another page. In fact, I found myself wanting more. Each time she started a new section, I thought I’d learn more about her life in Shanghai and Beijing. But by the time I finished the book (it’s a quick read at 208 pages), I didn’t know any more about her than I did after reading the first chapter. She came to China with her husband, the journalist James Fallows, and lived for a few years in the early- to mid-2000s in Beijing and Shanghai. Deborah Fallows’ writing is fluid and engaging, but I wonder if her editors sold her short on this one. Her chapters on love, manners, and rules certainly could have made for intriguing and captivating stories. Yet they each seemed (to me) too short, providing only a teaser of her real frustrations and triumphs in learning the language. As someone who has studied Mandarin and experienced similar challenges in learning the language, I remember the first time I dreamed in Mandarin. I don’t recall the subject, but it doesn’t really matter. We were all speaking Chinese in the dream. I’d only been studying it for a couple of years at that point. It might even have been around the time I ventured out to the Mao antique shops on Hollywood Road in Hong Kong. I’ve often spoken to other people who’ve studied foreign languages and the subject of dreams never fails to pop up. It’s such an important milestone in learning another language. So I’m surprised Fallows’ editors allowed her to use this title without writing about her first dream in Mandarin.